Every week we pull together some great Canadian recipes from Canadian food bloggers around the web featuring one main ingredient or dish. When we asked our bloggers to share their best potato recipes we were overwhelmed by the response! So many amazing potato dishes came our way. It was so hard to pick just 20 to be featured that we decided to include them all and create the FBC Ultimate Potato Recipe Collection! Potatoes sometimes get a bad rap for being boring, too simple or too "carb-y". But the truth is, they're low calories, full of potassium and vitamin C (yes!) and B vitamins and, if you leave the skins on, they're high in fibre. And they're a black canvas when cooking - you can jazz them up in so many ways. In fact, we have over 70 ways you can make the most of the simple potato from classic mashed potatoes (check out Simple Bites article on the secrets to the best mashed potatoes) to more adventurous fare from India, Greece, Italy and Sweden! 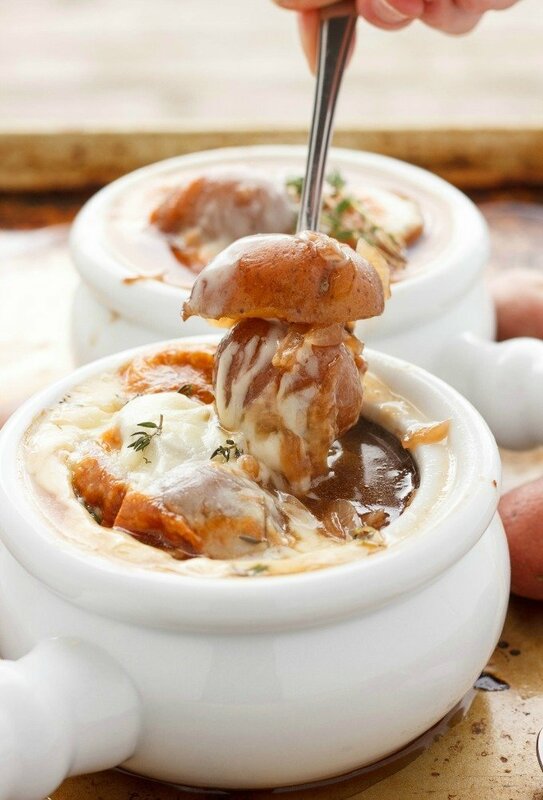 A twist on classic: **[French Onion Soup with Potatoes](http://thecookiewriter.com/french-onion-soup-with-potatoes/)**. From **The Cookie Writer**. The classic comfort food but with an extra punch of flavour, these **[Mashed Potatoes with Goat Cheese and Sage](http://sprinklesandsauce.com/mashed-potatoes-goat-cheese-sage/)** will be a winner. From **Sprinkles and Sauce**. Scalloped potatoes are a great canvas to experiment with. Try this **[Goat Cheese and Pumpkin Scalloped Potatoes](http://cocoabeanthevegetable.com/goat-cheese-and-pumpkin-scalloped-potatoes/)** version. From **Cocoa Bean the Vegetable**. Take potatoes and add milk or cream and cheese and you have a delicious gratin like this **[Potato and Spinach Gratin](http://www.juliascuisine.com/home/potato-spinach-gratin)**. From **Julia's Cuisine**. Roasted potatoes don't have to be just for a Sunday roast. Try mixing it up on a weeknight with **[Parmesan Roasted Potatoes](http://365daysofeasyrecipes.com/2016/06/01/114-parmesan-roasted-potatoes/)**. From **365 Days of Easy Recipes**. What do you do with all those "end caps" from spiralizing potatoes. Why not roast them? These **[Roasted Spiralized Potatoes](http://www.isugarcoatit.com/2015/10/roasted-spiralized-potatoes.html/)** look like mushroom caps! From **I Sugar Coat It**. Knödel is a German potato dumpling that works well with Russet Potatoes. This **[Mushroom Sauce and Kale Knödel](https://thefoodolic.com/2016/09/18/mushroom-sauce-and-kale-knodel/)** is from **The Foodolic**. You can't have a roundup of potato recipes in Canada without Poutine. This **[plant based poutine](http://kokoskitchen.com/holidays/plant-based-poutine/)** uses miso gravy. From **Koko's Kitchen**. Start your morning with potatoes in this **[Egg, Potato and Sausage Breakfast Casserole](http://leelalicious.com/breakfast-casserole-with-eggs-potatoes-and-sausage/)**. From **Leelalicious**. Known as Sabudana Vada, these **[Tapioca Pearl Potato Cakes with Tomato Chutney](https://veggiezest.com/2013/09/10/tapioca-pearls-potato-cakes-with-tomato-chutney/)** are a common Indian street food. From **Veggie Zest**. A Swedish take on a potluck fave - **[Swedish Potato Salad](http://www.thenomadicwife.com/blog/swedish-potato-salad)**. From **The Nomadic Wife**. Smashing potatoes can be very satisfying - and tasty when they're **[Dilly Smashed Baby Potatoes](http://avirtualvegan.com/smashed-baby-potatoes/)**. From **A Virtual Vegan**. Hasselback potatoes are another way to make potatoes look fancy and experiment with seasonings, like **[Thyme Garlic Hasselback Potatoes](http://ohsweetday.com/2011/07/thyme-garlic-hasselback-potato.html)**. From **Oh Sweet Day**. A big thank you to all our FBC Members who participated in this weekend's stuffing recipe roundup. If you're an FBC Member and would like to submit to future weekend link roundups, join our FBC Facebook shares and links forum or keep an eye out for your monthly members only newsletter. If you love getting Canadian recipes in your inbox, then you might want to subscribe to The FBC Food Lovers Newsletter. Once a week we’ll be featuring great Canadian recipes from FBC members, as well as occasional delicious offers from some of our partners. You don’t have to be an FBC Member to subscribe – you just have to love food! All you have to do is click here to subscribe! Oh man these all look so yummy, and just in time for Thanksgiving too!! !